My weekly stops to West End Comics, so conveniently run at the top of my street always pays off, and this week, Kirk (who has yet to steer me wrong on a recommendation, talk about knowing your customers!) sent me home with this week’s pull list! 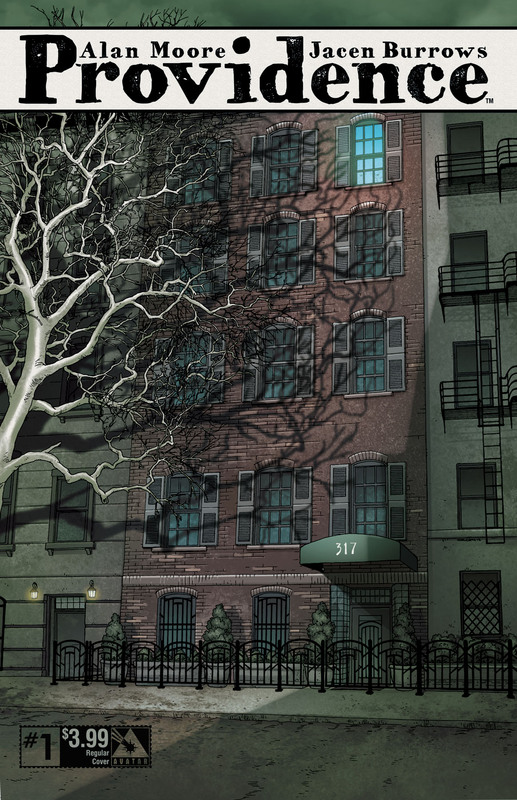 Providence Issue 1 – Alan Moore is back! That tends to be enough for most comic fans to pick this new series up. Featuring a story by Moore, sharp art by Jacen Burrows with colours by Juan Rodriguez and letters by Kurt Hathaway, this one I think is going to be a slow burn, and is definitely unnerving so far. Featuring a New York reporter, Robert (make sure you read his hand-written journal entry at the end as well) seeking to fill some space on the paper, we follow him having a strange encounter with a strange doctor, Alvarez, who lives in sub-zero temperatures (for health reasons, but may in fact be dead, as there’s no visible breath) to talk about the hidden world, and two books, The King In Yellow and Sous Le Monde. This is intercut with flashbacks to Bobby’s earlier life, and what seems to be a strange event in a mausoleum(?) – Curiosity is piqued. Strange happenings, intriguing characters… let’s see where this one goes! Chrononauts Issue 3 – This by far is my favourite comic that I am reading so far (so imagine my upset when I learned it’s only four issues long – sigh). Mark Millar has proven himself over and over again, and I’m delighted there is such a back catalogue for me to go through when I’m done with this series. 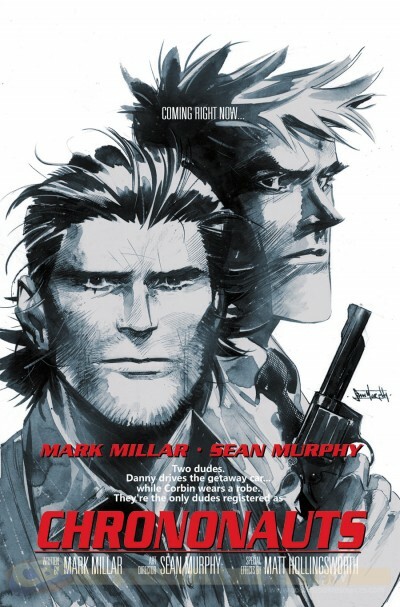 Co-created by Millar, who serves as writer, and Sean Gordon Murphy, who does some wickedly styled art, with colours by Matt Hollingsworth and letters by Chris Eliopoulos, the series follows a pair of doctors, Danny and Corbin, who thanks to the time suits they’ve designed have the ability to move back and forth through time. It was supposed to be for scientific purposes but the desire to muck about (taking credit for Beatles songs, creating Breaking Bad and Harry Potter (not to mention the visual nods the comic is filled with)) with the time line has been too tempting and things are quickly coming to a head, as they are pursued by their own agency through a centuries-spanning chase! Funny, sharply written, and just making time travel fun this one is not to be missed – and watch out for the amazing variant covers that pay homage to classic movies! 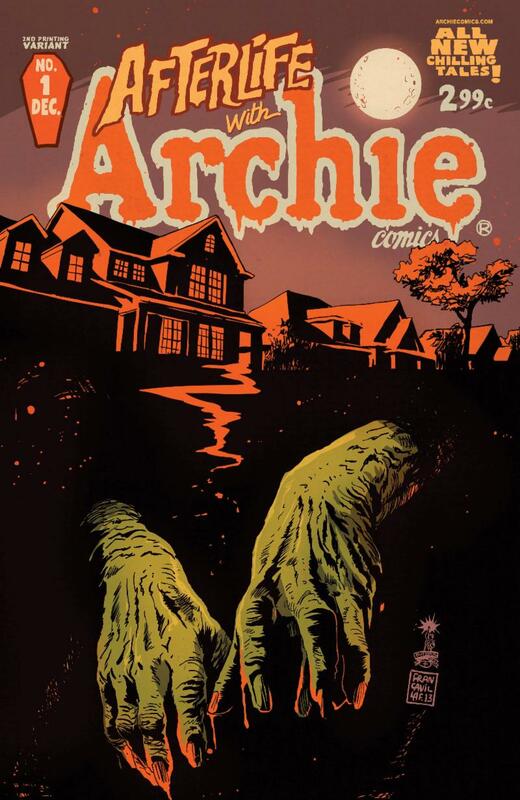 Afterlife with Archie Issue 1- I should have listened to Kirk when he first suggested this one to me months ago, and I didn’t. But after my experience with Sabrina last week, I figured I’d better play catch up on this title as well. With a story by Roberto Aguirre-Sacasa, art by Francesco Francavilla and letters by Jack Morelli, this one puts us in a much darker Riverdale. The jokes are few, the characters more like actual kids (though neighboring Sabrina still has her powers) and it starts off very much like an Archie version of The Walking Dead… Jughead’s dog, Hot Dog, is killed in an accident by Reggie, but is restored to life by Sabrina (despite warnings not too) and the poor animal doesn’t come back quite right, biting, and infecting Jughead, setting the stage for a bloody and dark tale. Enjoyably written with dark and moody art, I am happy to have a few issues of this to catch up on!! thanks for all the good ‘wordpress’ tim. i’ve started a couple of new titles that i’ll share with you next week!